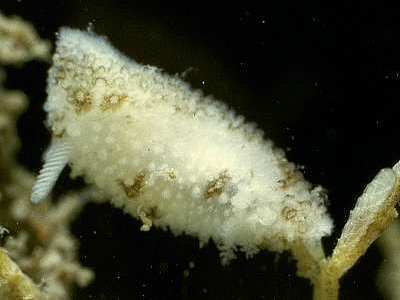 Description: The body of this nudibranch is narrow in comparison with other onchidorids. The mantle bears small rounded tubercles and is grey in colour with a few darker blotches on the back. It may grow to up to 8mm in length but most individuals are approximately 5mm long. 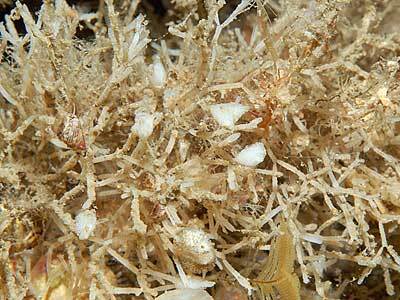 Habitat: This species is well camouflaged on its prey, Cellaria fistulosa, an erect, sublittoral bryozoan. 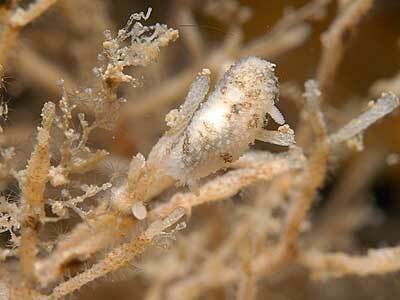 The spawn consists of a rounded mass of eggs looking like a swelling on the branch of the Cellaria. Distribution: Onchidoris oblonga is found at scattered localities on the southern and western coasts of the British Isles but is rarely recorded. Recent records include Lundy, Plymouth, the Irish Sea and the west coast of Scotland. Body elongate and rounded in the back, not flattened. Grey-white in colour with slight brown mottling. Picton, B.E. & Morrow, C.C. (2016). Onchidoris oblonga (Alder & Hancock, 1845). [In] Encyclopedia of Marine Life of Britain and Ireland.